In our National Picture of Welfare Reform series we reveal what we have learnt about the different impacts of welfare reforms across the country, using household-level data that has been aggregated. In this first blog post we look at the cumulative and aggregate impact that welfare reforms are having on households in London Boroughs, big cities and small cities and towns. Over the coming months the transition to Universal Credit (UC), and the introduction of the benefit cap, will become a reality for increasing numbers of people around the country. As the rollout of welfare reforms gathers pace, Policy in Practice has helped local authorities to understand the cumulative impact of welfare reforms on a household level through to 2020. For the first time, this household-level data has been aggregated, across the country to form a national picture, and to show how the impact of welfare reform differs between London Boroughs, large cities and small cities and towns. This analysis may help to predict the impact of each of these reforms on a local authority according to its demographic makeup. Many towns and cities that are not significantly affected today are likely to see a heavier impact in the future, with some parts of the UK seeing a major impact almost overnight as a result of welfare reforms. While Lord Freud, Minister of State for Welfare Reform, has stressed that the intention of the benefit cap is to encourage people ‘to take responsibility for their decisions in light of what they can afford’, and Universal Credit is ‘designed to simplify the benefit system, and support the transition into work’, these behavioural changes will take time. In the meantime, the introduction of welfare reforms is gathering pace with significant consequences; 69,900 have been affected by the Benefit Cap since its introduction in 2013 and the DWP predicts that another 120,000 will be affected in the year 2016/17. The average household in our sample will lose £64.25 through this cap alone. Cuts to in-work support remain in place under Universal Credit, affecting 80,000 households today, with rollout set to accelerate. The impact of these changes will be felt by each household affected, and we have modelled the likely reality of welfare reform on each low income household within a local authority, to help them to identify households particularly vulnerable to the transition. Our focus on household level impacts is based on our unique modelling capability. Typically, studies (such as the DWP’s July 2015 impact assessment of the new Benefit Cap) take a macro approach to the impact and cost of welfare changes, and consider reforms in isolation. In contrast, we assess both the individual and cumulative impacts of reform, and consider variation across towns and cities to offer personalised support to any local authority in the country, down to a household level. We find that the best measure of the impact of welfare reform comes from assessing the demographic profile of an area, rather than its geographic location, as well as the particular component of welfare reform in question, and how it interacts with other reforms. London Boroughs: medium-sized but dense in terms of population, with a high working age population. Big Cities: major cities with the biggest populations. Small Cities / Towns: mid to low population, low working-age population. There are significant demographic variations across these groups, with marked consequences regarding the impact of welfare reforms. It must be recalled that our sample of Housing Benefit and Council Tax Support recipients represent a proportion of the lowest-income households in the country. Through this demographic breakdown, we paint a map of the UK in which welfare reforms pose a range of imminent challenges to local authorities and other local organisations. In the case of the new benefit cap, almost 12 times more people will be affected in Small Cities / Towns, and their average household will lose an extra £12.25 per week compared to under the current benefit cap. 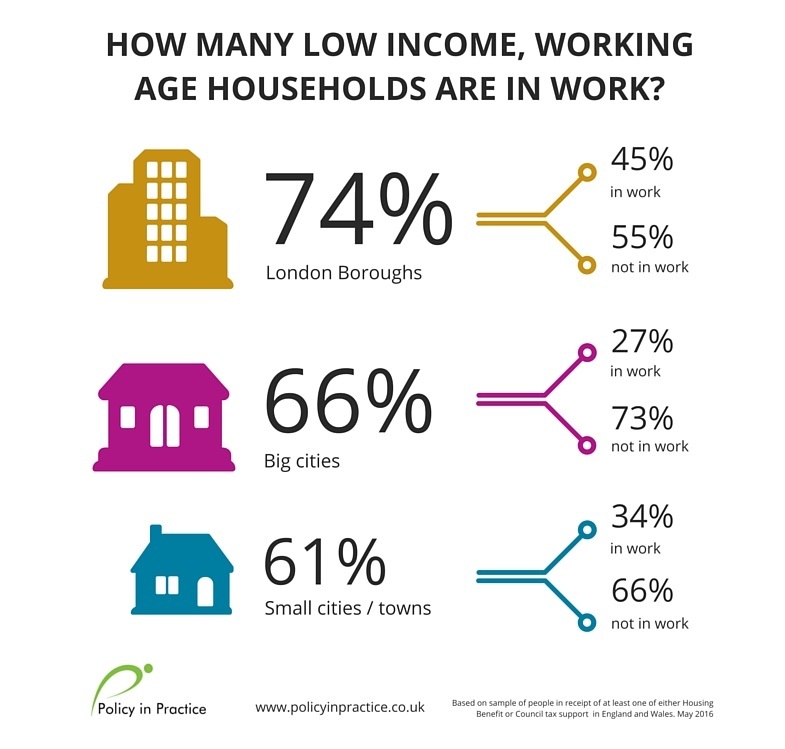 To give some context, only 3 times more people are affected on average in London Boroughs, and in Big Cities the average loss is only £3.75 a week. This variation largely comes down to the fact that in Small Cities / Towns the number affected by the current benefit cap tends to be negligible, whereas roughly 45% of all cases occur in London Boroughs (two of those sampled have almost twice as many people affected than any other local authority). Whilst many London Boroughs already have plans and systems in place to deal with those households affected, for local authorities classed as Small Cities / Towns in particular, the lower benefit cap will turn from an almost irrelevant issue to a significant one overnight. What are the impacts of other welfare reforms? However, it is not always the same areas which are most vulnerable. 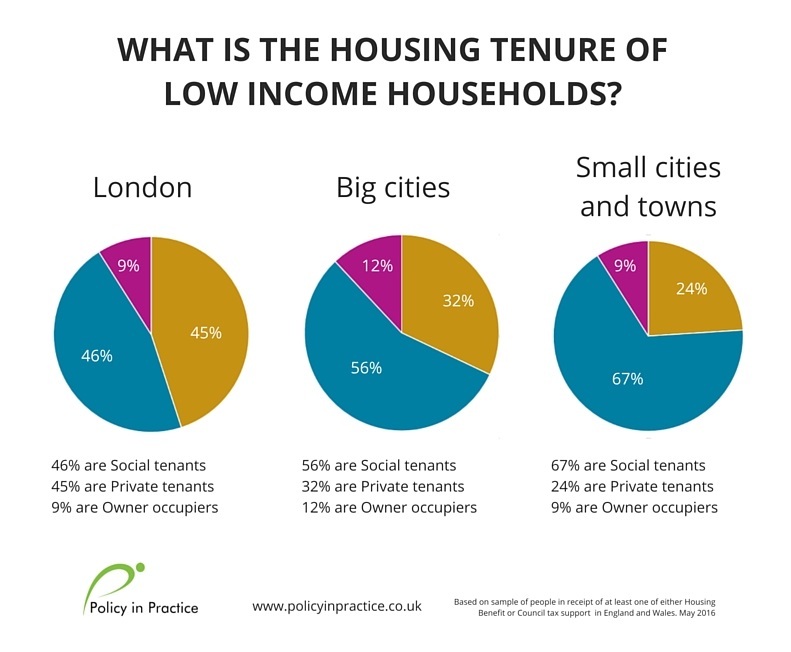 Turning briefly to the Under-Occupation Charge, we find that this particular policy most significantly affects Big Cities and Small Cities / Towns, because they have the highest proportion of people living in social housing. The reasons behind this will be explored in forthcoming blogs, which look in more detail at the impact of the Benefit Cap, the Under-Occupation Charge (Bedroom Tax) and the LHA Cap, and the impact of Universal Credit. We will also illustrate, through case studies, how local authorities can proactively prepare for the rollout of further welfare reforms. We will also discuss what mitigating action you can take now to minimise the impact of welfare reforms on your customers.